Join the performers of Flamencura as they explore chiaroscuro—the contrast between light and dark, sunlight and shadow, day and night—using flamenco music, dance and rhythm as their palette. The show takes place in an intimate setting, where you can enjoy a glass of sangria, chat with the artists, and take in an exhibit of photography by Julio Chacon and Estrella Gutierrez. Doors open at 9:00pm. $13, cash only. 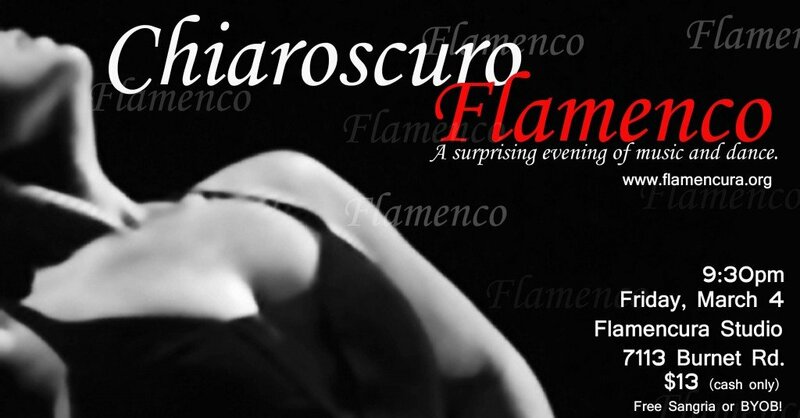 Seating is limited, reservations by phone or email recommended: (512) 942-7892 or info@flamencura.org. BYOB or free sangria! Flamencura Studio, 7113 Burnet Rd. (behind Dallas Niteclub).